The new e-Power electronic cigarette by Smok Tech is an interesting addition to the wide variety of personal vaporizers (PVs) and accessories that MadVapes has become known for. On the outside it looks like a slightly beefier version of an eGo, the PV that has taken the market by storm lately. The difference is in the battery, and unlike the eGo, you can actually get inside and take a look at that battery. Most factory manufactured kits are sold with a sealed housing that contains the battery, switch and circuitry. We have come to refer to these as ecig batteries, but the battery itself is actually a simple wrapped cell inside of that housing. Not so with the e-Power. The batteries in this PV are inexpensive and easily replaceable 1050mAh 14650 cells. Charging is accomplished by unscrewing the battery tube and removing the battery, which is then placed on the included charger. A second 14650 that is included with the kit can then be placed in the tube. 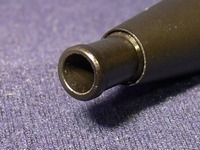 The tube is vented at the end for safety. This process will sound pretty familiar to anyone who has used a mod. It’s fitting that MadVapes, a company known for their wide variety of mod parts, kits and complete personal vaporizer mods, should be making this product available. The e-Power is essentially a mod that looks like an eGo, which is a popular design, so this is likely a good thing. Where the e-Power differs from a typical mod is in the switch. Rather than a simple momentary switch that is common to all but the advanced mods, the e-Power incorporates a control circuit. Testing indicates that this circuit regulates the output to 3.7V and also allows the lighted switch to blink when the battery is depleted. Mine actually stayed on constantly when the battery reached it’s limit, but the effect is the same. These are welcome features in a mod, as batteries that are getting low in a typical mod will continue to work for awhile, but provide a less than satisfactory vape. These features should be especially appreciated by new vapers. The switch is also replaceable and it will be interesting to see what that component is sold for. 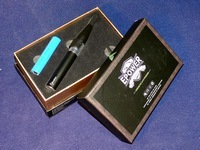 Also unlike the typical mod, the e-Power comes packaged in an attractive box similar to most other electronic cigarettes. I don’t have anything against receiving just a cardboard box with a tube and some batteries, but the completeness of this presentation makes this kit just a bit more attractive to a new user. The first layer in the box houses an assembled e-Power, complete with a switch protector, and a second battery. The battery charger, five 24mg Marlboro flavored cartridges and a manual are found on the second layer. It’s ready to go out right out of the box, but putting a full charge on the batteries before using will yield the best results. As mentioned before, the obvious design target was the eGo and MadVapes and Smok Tech have hit it. 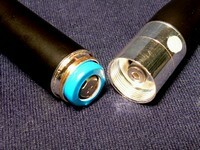 From a distance, the e-Power looks very similar, with its cone over the atomizer and bright band in the middle. Closer inspection reveals a slightly larger and heavier PV. The e-Power is 99mm long and 17mm wide, compared to the 650mAh eGo’s 71mm and 14mm measurements. 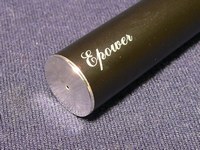 e-Power and eGo cones and batteries are not interchangeable, but the unit does use the ubiquitous 510 fitting, so a wide variety of atomizers and cartomizers can be used. This is still a comfortable PV to hold and carry. In length and weight it is actually much closer to the 1000mAH eGo, which it should closely approximate in battery life as well. Fit and finish are good. Everything screws together nicely and there are no rattles or loose components. The bright portion in the middle has a slightly cheap feel to it, but the coating on the rest of the unit is good. 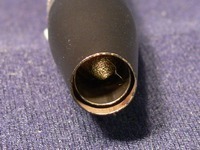 The cone is slightly longer than an eGo cone, meaning that it extends slightly beyond the atomizer. This has no effect when using cartridges or longer drip tips, but shorter drip tips end up a little too close to the cone. Regular sized cartomizers will be much more comfortable with a drip tip when using the cone. 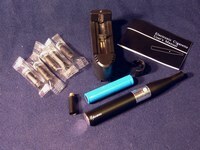 At $45.99, the e-Power is attractively priced for a complete kit. Falling midway between the lowest Riva prices available and the higher eGo prices, it represents a good value. That value increases quite a bit when the cost of replacement batteries is considered. Stocking up on a couple of extra 14650s only costs $6.49 apiece, a bargain compared to buying extra eGo batteries. After using the e-Power for a couple of days, I think MadVapes has a viable contender in the ecig kit marketplace. I’ve easily gotten a day of heavy vaping out of one battery and the vape at 3.7V has been good with either the included regular atomizer or a low resistance one. Carrying a couple of extra batteries is convenient due to their smaller size and low cost. And it looks good, too. The e-Power should definitely find itself on the list of inexpensive PV alternatives. This mod will be right along side the other cone wearers that it’s dressed up as. I do not recommend this unit as the switch failed in 2 weeks. Its cheap cheap cheap made. If you look around, you can find the E-power standalone unit (no charger, carts, atomizers, etc; just the E-power cone, switch, and body) that uses 14500 batteries for $22. This means you can have a full high-mAH ego clone using batteries and chargers most vapers already have on hand. These aren’t vad deals regardless, but the pot gets sweeter and more convenient if you look around. Lol, I’m not a teacher, I just didn’t want to spam or plug another vendor out of the gate. Gotvapes has a basic kit; the stainless and titanium are $22, and the black is $24. These are labeled for 14500 batteries (though they’ll take 14650’s as well), which is why I mentioned them. You’re right as far as brand new vapers usually not having the batteries on hand, but 14500’s seem to be the first batteries most of us end up with a stash of. They’re also much more versatile than the 14650 batteries, as it seems there are more 14500 battery mods around than any other. 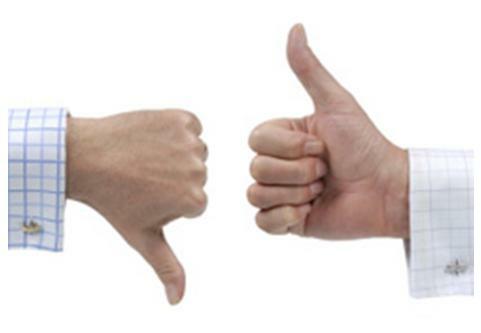 We have no problem with a recommendation and link to a supplier as long as it is a good one and relevant to the topic at hand (unlike the huge quantity of spam “comments” – most having nothing to do with vaping – that we receive, which we make sure never see the light of day).